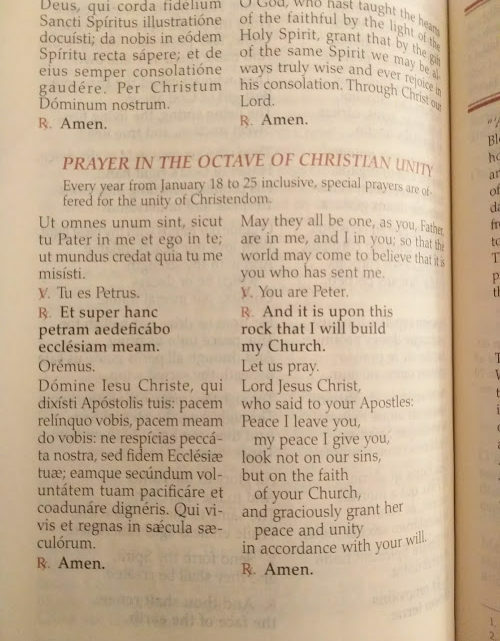 Yesterday began what is called the Octave of Christian Unity – the set of eight days in which the Church offers up prayers with Jesus’ prayer that we “might all be one.” It runs from January 18-25, so it’s not too late to jump on it (I remembered and jumped on it today, in fact). I suppose there are probably a number of prayers you could pray. I, myself, prefer the one found in my Daily Missal by Midwest Theological Forum (pictured) because it stresses the essentialness of the Petrine unity. Pray that all separated brethren might come back to full union with God’s One Holy Catholic and Apostolic Church! R. And it is upon this rock that I will build my Church. Lord Jesus Christ, who said to your Apostles: Peace I leave you, my peace I give you, look not on our sins, but on the faith of your Church, and graciously grant her peace and unity in accordance with your will.